Input text: a light cyan statue is standing. the sky is pink. the dolphin is 7 feet behind and 3 feet to the left of the statue. the dolphin is 7 feet in the air. a very small palm tree is 4 feet to the left of the statue. a small television is 3 feet in front of the statue. the television is facing east. 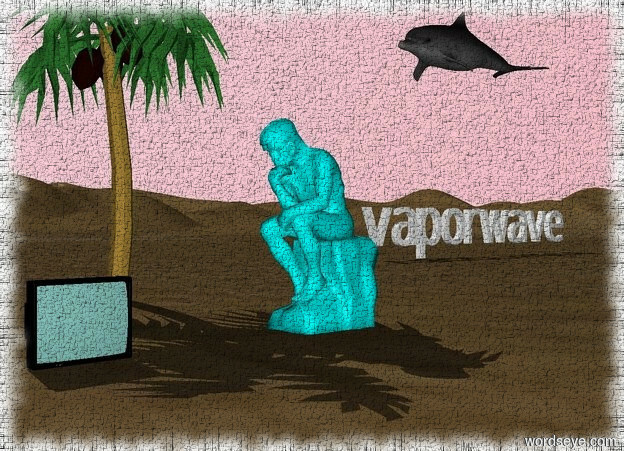 big "vaporwave" is 20 feet behind and 10 feet to the left of the palm tree. "vaporwave" is facing east.